1 note card, or a piece of thicker card stock. Cardboard from a cereal box will work also. 1. Roll paper 1 turn around plastic tube. 2. Squeeze white glue in thin streaks (kite string size) around perimeter and zig zag the middle. 3. Roll paper very tightly around tube and rub outside of rocket until glue holds. 4. Remove plastic forming tube and place paper tube on the assembly stand. 5. Cut 2 pieces of card stock paper about 1 ½ x 2 ½ inches and fold length wise. 6. Cut one loose end at about 45 degree angle while folded and not cutting across the fold. 7. Glue along the fold and place one piece on each side at bottom of paper tube facing straight upward. Let glue dry. 8. Cut nose cone by twisting metal tube thru foam and push foam out of metal tube on assembly stand. 9. Sand one end round (like the tip of a rocket). 10. Squeeze foam to fit half way into paper tube and use tape to hold it very tightly in place. Have fun and keep experimenting. Contact Us::.. Visit our friends at HOVERCRAFT.COM::.. 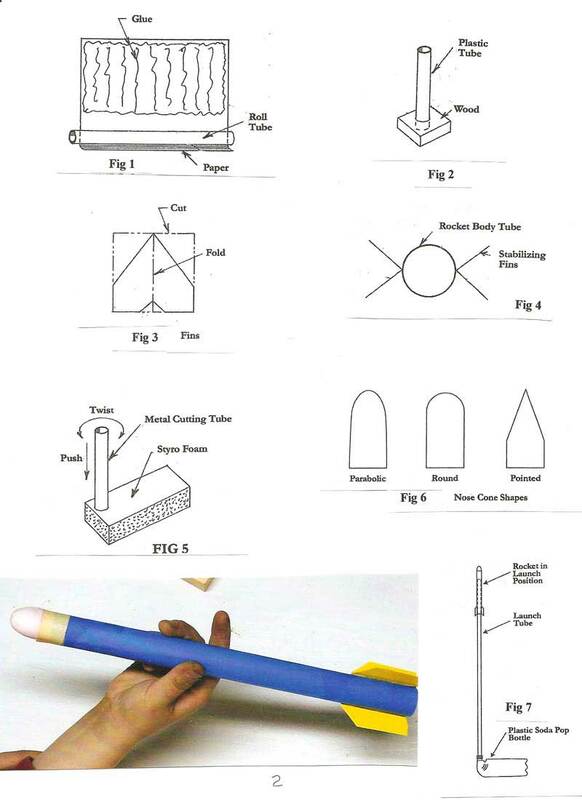 Fly further with experimental model rockets::..